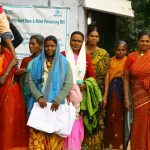 At the Centre for Environment Concerns, an NGO based in Hyderabad, India, the challenge was clear: develop an inclusive irrigation technology suitable for low rainfall areas. Alongside farmers and female farm labourers, they developed a system that provides assured moisture directly to the plant root zone. Initial trials show two unique benefits: it requires about one fifth of the water needed for drip irrigation and it supports a healthy soil ecosystem. Key to the effectiveness of this technology appears to be the gradual wetting of the soil rather than abrupt provision of water in ‘concentrated’ loads. In semi-arid areas of India, low rainfall with frequent and long dry spells during the monsoon makes farming ever more difficult, taking its toll on large numbers of smallholders, many of whom rely on seasonal rainfall for irrigation. In the light of water scarcity the Indian government has looked to canal irrigation from tanks and dams, tapping groundwater from ever deepening aquifers, drip irrigation and now greenhouses. Although the provision of copious irrigation water to selected areas for cereal crop cultivation has helped India move from ‘begging bowl to bread basket’, much of these ‘green revolution’ areas are affected by severe salinity and falling productivity. Moreover unsustainable use has led to alarming rates of groundwater depletion. It is amidst these circumstances that the Indian Prime Minister has called for “more crop per drop.” Unless water efficiency and soils are improved by ‘out of the box innovations’ and farmer centric practices, the Prime Minister’s ambitions will not be met. The Centre for Environment Concerns has been working for the past three decades to improve farmers’ livelihoods in drought prone areas of Andhra Pradesh. 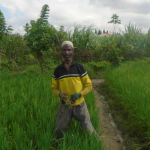 Based on this experience, the centre became convinced that irrigation is crucial for successful farming. Further, through work on the National Rural Employment Guarantee Scheme (MGNREGS), a programme providing 100 days of employment per rural household per year, the toil of women added another dimension to the centre’s challenge. Under the employment scheme many women were employed on massive fruit tree plantations. The saplings require irrigation for the initial three years. Women need to head load and fetch water from long distances in the hot summer months. Although the work is hard, the wage is crucial. Yet, in the hot summer months, women have had difficulty to even find enough water. We needed alternatives that would use less water. We need an irrigation system that drastically saves water and labour so that all farmers in water scarce regions can access and use irrigation when needed. During interactions with farmers on how to reduce irrigation water requirements and increase its efficiency, we learnt that many sacred groves of fruit, ornamental and medicinal plants were successfully grown with little water by using buried clay pots. This traditional way to grow trees with less water uses the suction capacity of the soil and root system in tandem with the sweating properties and slow release of moisture by clay pots. But it had problems; each tree had to be served with water, pots were not standardised and had problems of clogging, for example. We decided to probe further using modern sciences and materials and farmers’ experiences. Key criteria guiding design of a new irrigation system were: drastically reduce plant water requirements by serving water only at the root zone in the form of adequate, well spread and assured moisture. In addition, the system should function without electricity and it must be automated to eliminate drudgery. During two years of action research, the first model was developed and tested. The basic principle was served – water was reaching the root zone. But there were problems such as clogging of pipes. 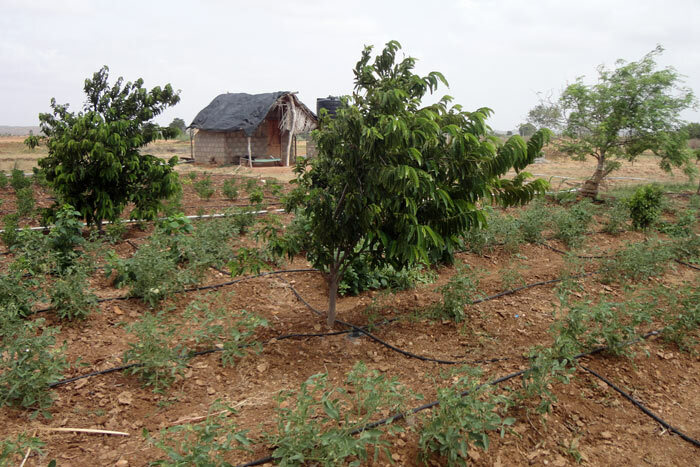 After two years of technology iteration, at the beginning of 2014, the final product, named System of Water for Agriculture Rejuvenation (SWAR), was implemented on a fruit tree plantation under the national employment scheme. Rainwater is harvested or water is fetched from nearby water bodies. This water is then pumped to an overhead tank using a pedal pump. From the tank outlet large diameter pipes deliver water to the field. From this pipe, smaller, UV and rat resistant lateral pipes deliver water to rows of plants. Near each plant a measured dripper lets water slowly through a pipe into the specially baked buried clay pot. The pot is buried about 30 cm below the soil surface next to the plant root zone. From each pot two micro tubes half way up the pot, fitted with a sandbag, let water slowly ooze into the soil. After some time the pot begins to sweat and this is based on the suction capacity of the soil and the plant roots. Water supply to the pots is regulated through control levers so that all plants can be reached with gravity flow. To facilitate microbial growth and spread of the moisture, we apply microbial inoculants that are prepared on site. The results are highly promising. Above all, water requirements are one quarter to one fifth of those prescribed for drip irrigation. And, despite much less water use, all plants grew well in terms of stem, leaf count and size and early plant maturing. Soil moisture remained for over a week after irrigating. There was no weed growth as there was no water on the soil surface. And, soil organisms grew well, likely as a result of the enabling environment of oxygen and moisture in the soil. With ongoing trials we are exploring the scope to further reduce water requirements of SWAR. In 2015 we also started using the system to grow vegetables and flowers. This helped show immediate results in terms of both soil and plant health and farmers’ incomes. In vegetables and fruits, where close planting is done, we found that one eighth of the water compared to drip irrigation suffices. 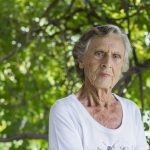 It was due to these promising early results that SWAR received the Global Champion Innovation Prize for Water and Forestry at the 2015 Paris International Agricultural Show. Accepting new technologies takes time. Though farmers have been involved in experimentation, further on-farm testing and development of the technology will reveal more about the practical value of this technology for farmers struggling with drought. India is a large market with a desperate need for water efficient irrigation technologies. Serving the market is difficult as it is dominated by heavy subsidies exclusively targeting technologies owned by large corporations, scientists guard their knowledge and government procurement procedures have high transaction costs. But together, farmers’ satisfaction with SWAR, the desire to bring more low rainfall areas under irrigation and the Prime Ministers’ call for increased water use efficiency opens enough opportunities to scale it up. The time has come to shift from rain dependent farming to harvesting and storing rain water and using it efficiently to cultivate crops. Optimum use of water – providing moisture rather than ‘concentrated’ loads of water – combined with healthy farming practices such as soil improvements, will make agriculture in India more sustainable and offer improved incomes to smallholder farmers. KS Gopal heads the Centre for Environment Concerns, Hyderabad, India and served as member of the Central Employment Guarantee Council and chair of the Committee on ‘Works on Individual Lands in MGNREGS’.